This post is the first in a series looking at the budget cycle and how civil society can most effectively engage at each stage of it. Timing can be everything when it comes to influencing government decisions. Luckily budgeting more or less follows a regular cycle throughout the financial year – things may be delayed or late, but decisions are often contingent on what has come before. 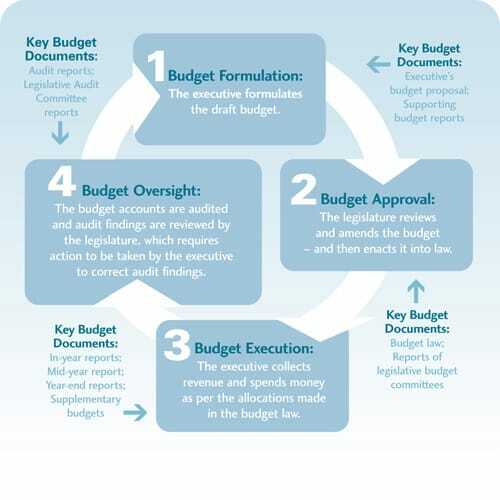 As the figure below shows, the budget cycle can be broken down into four stages. Civil society organizations (CSOs) looking to influence budgets can use their knowledge of the budget cycle to determine the timing and targets of their interventions. This post will focus on the budget formulation stage. It aims to explain what happens during budget formulation and examine ways that civil society can engage with and influence the budget planning process. What Happens at the Budget Formulation Stage? The first stage of the budget process takes place almost exclusively within the executive branch of government. Typically the budget office in the finance ministry coordinates the process, during which the executive proposes the parameters of the budget, how revenues will be generated, and how these resources will be distributed. The result of this process is the Pre-Budget Statement. For CSOs in countries in which the government issues a well-formulated Pre-Budget Statement, there is a critical opportunity to influence government policies and budget decisions. For instance, in the United Kingdom, the Institute for Fiscal Studies analyzes the government’s Pre-Budget Reports and publicizes its recommendations to try to influence the government before final decisions have been made. And in Brazil, the Pre-Budget Statement must be approved by the legislature, which gives CSOs an opportunity to influence its contents. Those that don’t have access to a Pre-Budget Statement should be aware that the budget is rarely constructed from scratch. Major parts of the budget may be anticipated by drawing on evidence generated from analyses of previous budgets. While not ideal, such detective work can be used to advocate for or against things likely to be in the budget proposal. In addition, CSOs can gather public opinion on what should be in the budget and use this information, along with their own budget analysis and monitoring, to communicate needs and priorities. There may also be opportunities for CSOs to establish informal lines of communication with executive branch officials. In countries where the legislature has limited authority to amend the proposed budget, the formulation stage may be the only opportunity to influence what ends up in the budget. It is critical that CSOs take advantage of this opportunity, as decisions made during the formulation stage can often have an impact several years into the future. CSOs can aim to influence what goes into the Executive’s Budget Proposal, a blueprint of action for the government in the coming budget year and a definitive statement of the executive’s priorities and commitments, in a variety of ways. In South Korea’s Top-Down Budgeting System, each ministry and agency establishes an advisory committee whose members are selected from academia, the media, the private sector, and civic groups. Committees are empowered to solicit requests and feedback from a broad group of stakeholders, and can provide suggestions, advise on various budgetary and fiscal matters, and vet or veto budget proposals. Public hearings are another way to offer input into the government’s budget proposal. Botswana has introduced an initiative that uses an innovative “budget pitso” (or consultation forum) system to enable the public to be part of budget formulation. This “pitso” has its origins in the community participation “kgotla” system, which is one of the oldest forms of public participation in governance in the world. In Kenya, private sector groups and CSOs represent citizens at public hearings held over a number of days. The public is also invited to submit suggestions via email or post, as a way of influencing budget priorities. Opportunities also exist for public participation outside of the executive. In Germany, the budget committee of the parliament holds public meetings and hearings to identify the public’s perspective in advance of the budget proposal. These are just a few examples of how civil society and the public can engage with the government in the formulation process each year. Additional examples with greater detail can be found by exploring the data on public participation from the Open Budget Survey 2015. The Global Initiative for Fiscal Transparency has also just released a guide and set of case studies on public participation in fiscal policy. For further guidance on civil society participation in the budget process, review some of the resources and guides available on our website. Stay tuned for the next blog post in this series that will focus on participation in the budget approval, or enactment, stage in the budget cycle.